Version 0.2 of Unchecky was just released! 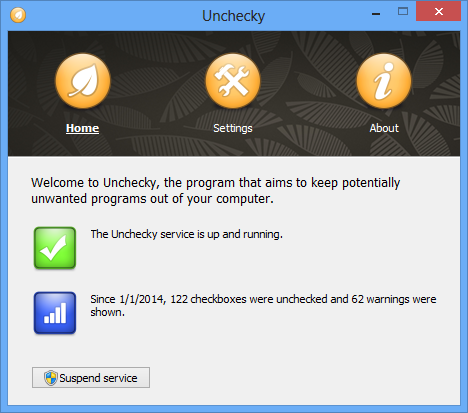 The main and most visible change is the new interface of the main Unchecky program. It provides you with information about the amount of checkboxes it unchecked, and the number of times it warned you. It provides additional advanced settings: disabling automatic updates, and disabling hosts file rules usage. Although Most users don’t need these settings, I’ve received questions about them. Some users were even angry at Unchecky for not mentioning the hosts file anywhere. Well, now it’s mentioned, and is even controllable (with a big warning). So if you really know what you’re doing (e.g. you’re using a custom hosts list), you can turn it off. While Unchecky v0.2 is still labeled as beta, it’s much more stable and robust than the early v0.1.x versions. More than 20 issues were closed. Many more installers are supported. If you were hesitant to try Unchecky because of its early age, you might want to consider trying it now. You can get Unchecky at unchecky.com. Posted in Software, Updates by RaMMicHaeL at January 2nd, 2014. I had some problems with the previous hosting, and eventually had to move the website to a new one. I believe the website should resolve correctly now. Please try again let me know if it doesn’t work for you. I’ve made the Greek translation of your application “Unchecky v0.2”. What email can I send? Bonjour. J’ai installé java et j’ai eu deux programmes indesirables Optimizer pro et Anyprotect. Je ne sais pas comment fonctionne votre logiciel mais je pensé qu’il intercept ces programmes et ce n’est pas le cas. Pourquoi? very nice tool, the only thing what i want is to kill the adware OpenCandy what is bundled with many tools without showing a checkbox. At this time i use universal extractor to see, if OpenCandy is bundled with the software. Unchecky should handle OpenCandy. Have you encountered an installer with OpenCandy which Unchecky doesn’t work with? If you can reproduce it, please let me know. Also, please note that OpenCandy is handled by the hosts file rules. Make sure you didn’t touch the advanced options, which allow you to disable those. You’re talking about the OpenCandy process, right? Well, that means Unchecky works. It doesn’t rip off OpenCandy completely, just blocks the access to their server. yeah it work, but windows dont close the OC Process and i cant use the PC without reboot. Looks like a bug of OpenCandy. Do you see this behavior only when Unchecky is running? I tested it without blocking with the hosts file, the system is not busy, but OC is running until the next boot. The thing is that those screens change over and over after some months, and you’d need to handle it. If this service forgets to handle only one of all the ad screens correctly, it is useless to me – I have to check every screen on my own. If I’m not mistaken, this software was developed for people they do not understand computers and installations, and as default , they every time click on “Next”. While Unchecky is not (and cannot be) a perfect solution, it can be helpful for every kind of user. * If you’re an inexperienced user, and think that the way to install apps is next -> next -> finish, Unchecky will help you by automatically decline most of the offers. * If you’re an experienced user, and you do check for offers, you shouldn’t stop checking for them, but most of the time you won’t need to uncheck them yourself, as Unchecky does this for you. This might seem very minor, but that’s really nice when you look at four checkboxes which you would have to uncheck, but they are already unchecked by Unchecky. Also, if you do miss an offer once or twice, there’s a good chance that Unchecky will handle it for you.